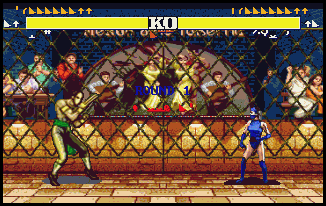 Ever since Capcom released X-Men vs. Street Fighter in 1996, fighting game crossovers ceased to be the stuff of speculation and became reality in the gaming world. 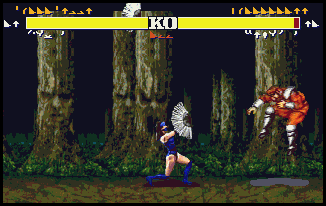 Beginning with various titles that pitted characters from various Capcom games and Marvel comics against each other, the year 2000 ushered in even more fantasy dream matches top as warriors from rival company offerings went head to head in Capcom vs. SNK: Millennium Fight 2000. Street Fighter II's Ryu versus Art of Fighting's Ryo Sakazaki? Indeed. Chun Li versus the deliciously bouncy Mai Shiranui of Fatal Fury fame? Be still my beating heart. But in addition to the fantasy matchups seen in such games as Super Smash Brothers, an astounding number of Flash offerings and fanmade titles have provided gamers with the opportunity to see their favorite brawlers from various universes come together in order to determine who among them is the greatest fighter in all the multiverse. But it wasn't always this way. 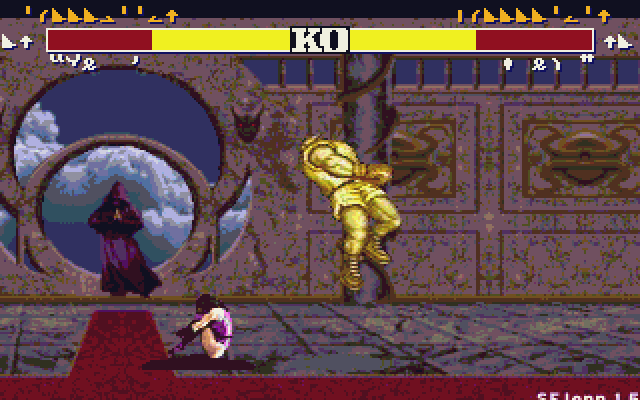 In the early 90s, enjoyable fighting games were a virtual rarity, with only Capcom and SNK and the occasional outside company providing a worthy playing experience -- and even then, those of us without the required consoles or money for games were barred from enjoying them in the comfort of our own living rooms. As such, with the Internet becoming widely available to home users, these reasons prompted PC gamers and fighting enthusiasts alike to venture online in search of entertaining one-on-one battle experiences. Actually, the 'net did wonders for PC gaming all around. Where before players were forced to plunk down $1-5 to purchase game demos from software shop bins, various websites allowed us to download shareware games for free and further expand our playing choices. But while a number of these went on to become my favorite PC games ever, perhaps even more interesting than these were the existing game hacks and homebrew titles. 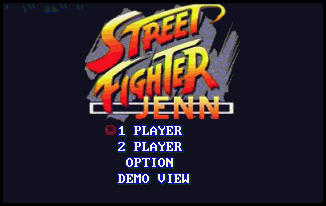 Among these was Derek "Lanzer" Liu's SFLIU, a weird modification of a homemade Street Fighter II clone that actually managed to somewhat replicate the gameplay of Capcom's fighting masterpiece on the PC. Of course, almost everyone in my circle owned some version of the game. 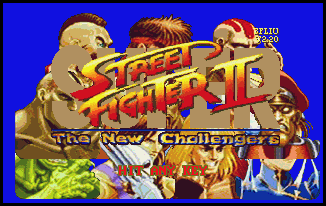 For my part, although I acquired Super Street Fighter II for the SNES in 1994, I also had the official PC version of SFII (which had fantastic graphics but played absolutely nothing like the arcade and console versions). 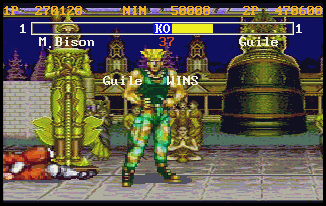 The appeal of Liu's game, however, was that it simultaneously was and wasn't our beloved Street Fighter II. 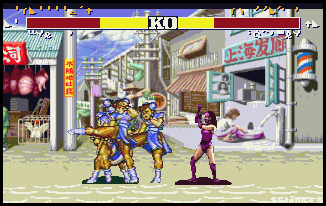 Upon winning a match, fighters would grow to twice their normal size. 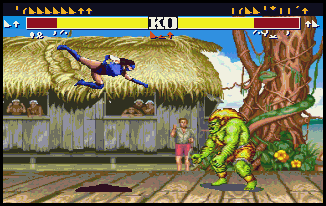 Despite more or less looking like the Champion Edition, later versions of the game endowed the characters with strange replicas of their Super Turbo specials. 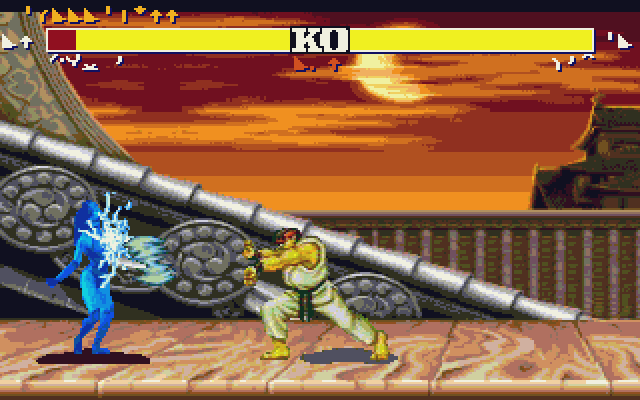 And in the initial releases, for whatever reason, Terry and Andy Bogard had been substituted for Balrog and Vega -- thereby making SFLIU and the game on which it was based, SF2IBM, two of the earliest fighting game crossovers of which I am aware. It didn't stop there. With the knowledge that other characters could be incorporated into the game, technically inclined fans had a field day modifying the game to support additional combatants -- and given the scarcity of information on the web today regarding these fanmade versions of SFII, I began to wonder if I'd imagined it all. There was one version in which half of the cast was comprised of Capcom's gang and the other half consisted of characters from the anime "Ranma ½". 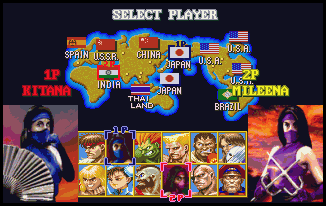 Another version included "Dragon Ball Z"'s Son Goku among the fighters. But perhaps the most memorable were the several modifications featuring various participants from the Mortal Kombat tournaments. In particular, I remember a version that included all of the various palette swapped ninjas -- Scorpion, Sub-Zero, Smoke, Noob Saibot, Ermac, Reptile, Rain, and even some new ones created specifically for the game -- in addition to Ryu, Ken, and a few other members of the SFII roster. Unfortunately, at the time of this writing I have proven utterly and spectacularly unable to find it (or the original SF2IBM) for download. In fact, until just several days ago, I had been unable to find any of these ancient games, as my manifold Google searches involving "mortal kombat" and "street fighter" only led me to the numerous Flash movies and fangames created in recent years. I'm not exactly sure what unholy combination of terms led me to The Kombat Pavilion, but when I arrived on one of its pages I knew that I had found one of the targets of my ongoing search. 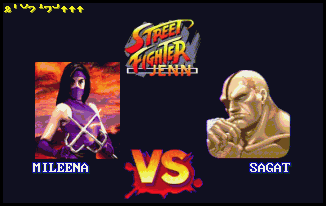 Yes, here was Street Fighter Jenn, Jenn Dolari's SFLIU mod that substituted kombatants Kitana and Mileena for E. Honda and Dhalsim, possibly because Capcom's roster was always kinda short on women and nobody really likes those two losers anyway. And with this download, another portion of my quest to recapture the past was complete. Aside from the weirdness of the in-game text displays, which may be the result of some odd incompatibility with DOSBox, the game is pretty much exactly as I remember it. 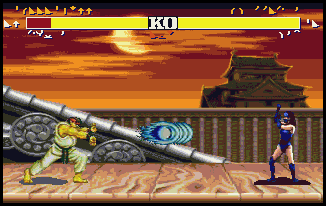 It doesn't play exactly like SFII, and there are far better and more interesting fighting games available in today's freeware market, but these were never really the appeal of SFLIU and its offspring to begin with. Much like Capcom's Vs. series did in later years, they enabled players to pit fighters from various game universes against each other -- and considering that Capcom and Midway will probably never team up to create an official version of Street Fighter vs. Mortal Kombat, SFJenn is one of the only ways you'll get to see everyone's favorite Outworld kunoichi take on the World Warriors. 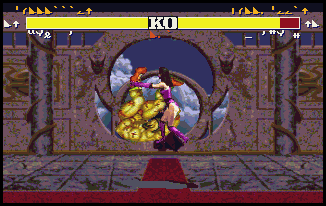 That said, the game doesn't play too badly and offers a fairly enjoyable experience for as long as the novelty of seeing Kitana and Mileena among the Street Fighters lasts -- and given that the game is more or less the same except for the inclusion of these foreign characters, you'll probably want to play as one of them. 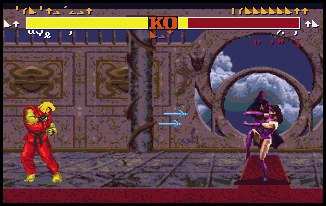 Fans of the MK series will probably get a kick out of seeing the MKII backgrounds represented in the game, not to mention several other interesting little touches for the Outworld kombatants. (For example, instead of catching fire when hit with specials like red Hadokens and Psycho Crushers, the girls stagger backwards as if they've been shocked by one of Raiden's Thunderbolts.) 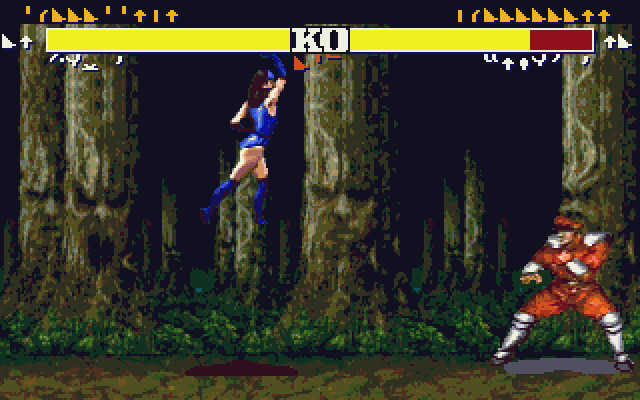 They've also got all of their trademark special moves at their disposal, though these moves draw significantly less blood and have been modified in accordance with the game's engine. Granted, that doesn't affect most of the specials, but Kitana players may feel especially saddened by the change to the Fan Lift, which now functions as a knock down move instead of lifting an opponent into the air for combo setups. However, in addition to their normal repertoires (sans fatalities), Dolari has also endowed the girls with extra specials like spinning piledriver, lightning kick, and dragon punch variants. 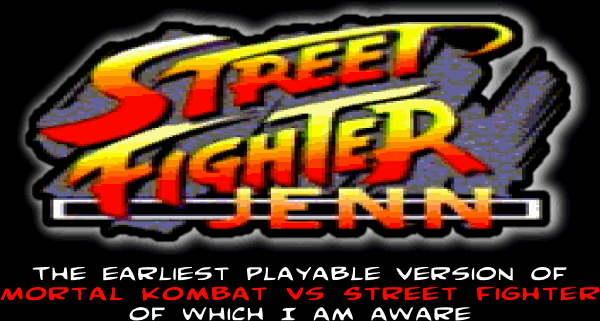 It's like she knew that the main draw of SFJenn was the presence of the MK gals, so she went ahead and gave them the best moves of the other characters as well -- effectively removing almost all of the functional reasons for picking anyone else.